Another week, another Book Crush of the Week. 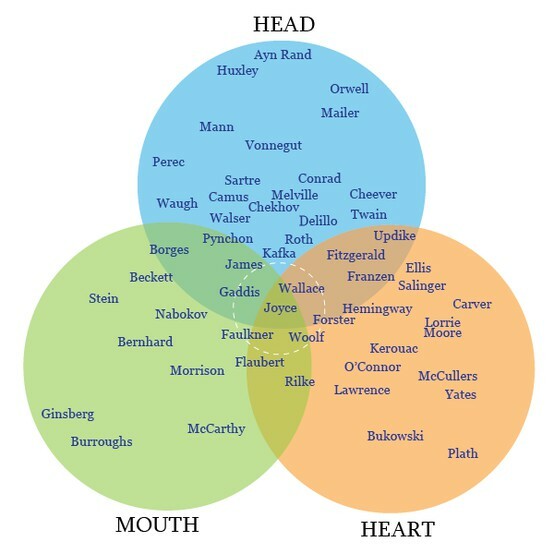 We dig this Author Venn Diagram from HTML Giant, which categorizes authors into three main writing types (head, heart, mouth) and plots their intersections. We're fans of the concept, although we have a few minor quibbles with some of the author placements. What category (or categories) do your favorite authors tend to fall in to? Do you like a certain mix in your books or do you lean heavily to one specific category?